Now as some of my long time follows may remember I base these figures up to use in the game “Demonblade”, which means they are based up in units of five on a 34mm hexagonal base. So two unit’s equals ten figures right? Well on closer inspection of the draw that contained them, there were only fifteen figures of these Rafm produced yeoman in total, so I decided to bite the bullet and pull out all fifteen (I could them cross the box off of my list, always a good feeling). The figures were cleaned up and glued in fives (using PVA wood glue) to short lengths of wood as this makes them easier to paint, they can then be pried off of the wood and glued onto the hexagonal bases later. They then went for their customary coat of matt black. 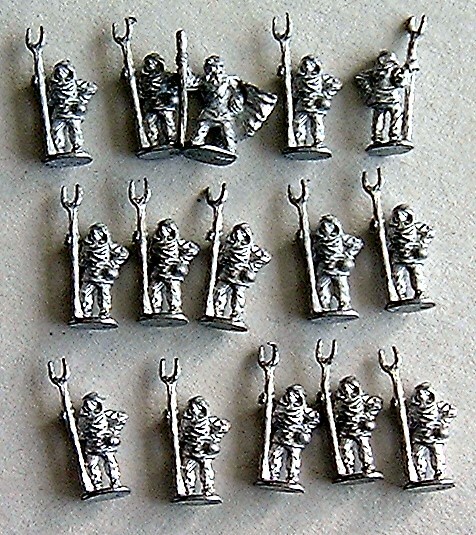 Painting was started with the pitchforks and small leather bags each chap has at his waist painted chocolate brown, them the forks were highlighted with butternut and the bags with leather. Then as I wanted a mixed random appearance to the units I dug out some “earthy peasant” colours, these being stone green, earth brown, light blue, khaki, pink burgundy, coffee and Lincoln green, and randomly painted two of the tops and two of the trousers one the figures in these colours. The leader figure (who looks like Mosses to me), I gave a coffee top and khaki leggings. All of the above were then highlighted with the same colours mixed with a little titanium while. Turning to their boots and belts next these were painted in using more chocolate brown with leather highlights. Faces and hands came next so an undercoat of European flesh was applied to these areas then their eyes were dotted in using black, then highlights were applied to the flesh areas with a mix of European flesh and pale flesh. The leader then had his cape painted royal blue, and highlights of bright blue were added to this. Lastly his hair was added in dark grey with light grey highlights (he really reminds me of Mosses now!). Now the rest of my fifteen millimetre fantasy figures are not quickshaded, but for some reason I really wanted to “shade” these chaps, much musing later and I decided to go with the quickshade, so a coat of the strong tone was painted over the figures next. When it came to basing the little blighters I began by cutting three 34mm hexagons out of some card then cut three more but slightly smaller and glued the smaller ones on top of the bigger ones. Then the three rear most figures of the five on each base were glued into place and filler was spread around there feet (as this is easier while I have access to the front of them), then the front two figures were glued into place and the process was repeated around their feet. Once this was dry I then painted the bases in scenic brown (this is a real pain to do I have to say! ), and then I repeated this with scenic green (but in a less accurate way, wouldn’t exactly call it a dry brush more a “hap ’hazard” brush). Then finally I brushed PVA glue over the bases and then flocked them with some “Javis” pasture green flocking. The figures then went out for a final spray coat of matt varnish, and that was another box crossed of the list. Well one month down, I wonder what February will bring us… time to roll again. This entry was posted in 15mm fantasy, fantasy and tagged 15mm fantasy, fantasy. Bookmark the permalink. I once painted a 15mm Napoleonic army for a friend of mine many years ago and vowed never to paint 15mm scale figures ever again. I really do admire the way you have painted these. Job’s a good ‘un! I wouldn’t have even attempted to paint them! Thanks Bryan, though I am a 28mm man at heart, I do occasionally have little forays into smaller scales, Myles (the eldest) is a big fan of 6mm, though I generally don’t like anything smaller than 10mm myself. Really basing these bu**ers was the worst part of the process. Irregular Miniatures do a 15mm (really more 20mm) Amazon army I have my eye on as a possible reward for not buying any figures this year, I painted up their 15mm Undead one a few years back now and then passed it on to Myles, but we’ll see. Like Bryan, I can’t imagine painting this scale leg alone anything smaller, great job on them too Roger! Thanks Andy, I’m sure both you and Bryan could do a fantastic job of painting smaller scale stuff. Cheers Roger. Wonderful stuff Roger, and a fine addition to your “Demonblade” forces. You must have enough now for a group shot? I’m a big fan of 15mm (and 10mm too), and these have come out terribly well imho. Ha ha! I might have enough for a group shot (thought there are still a few left to do) but I have just this second come back down from the loft, where I was putting them away in their box with the rest of my 15mm stuff. So no I’m not going back up again (sorry). I know you are a big small fan, I’ve seen some of your wonderful WW2 and Aliens figures. Very nice, Roger. As with the others, I very rarely delve into scales smaller than 28mm, but have used some 15mm demons as 28mm Chupcabra. The advantage with 15mm is you do tend to get a lot of figures for a reasonable about of money. Thanks Jez, I think the vast majority of us would love to do everything in 28mm (there are of course exceptions, and some people game exclusively in smaller scales, and more power to them). But as you so rightly say, there is always the draw of the quite significant increase in number of figures you get when you drop a scale (or two). I almost went for the 15mm option when I was ordering my VBCW figures. There’s a good chance some more of the “littler stuff” will turn up over the next few months. Well done Roger, that must have been a good feeling getting these scrubbed off the list. It certainly was, not he most exciting weeks painting ever, but at least I never have to go back to them now.